Volunteers Diane Littlefield and Ann Ague examine a card before stamping it. More than 100,000 cards will go through the Loveland Post Office this month to get a special postmark from the “Sweetheart City” as part of the Valentine ReMailing Program. “People from all over the country and world have their Valentine’s Day cards stamped here so it has that something extra special,” said Gov. Jared Polis, who helped kick off the program’s 73rd year by serving as a guest volunteer stamper, along with Miss Loveland Valentine Kat Pfeiffer. “I’ve represented this area for a number of years and now as governor, it’s great to highlight what Loveland does across our whole state,” said Polis, referencing his time in Congress. Gov. 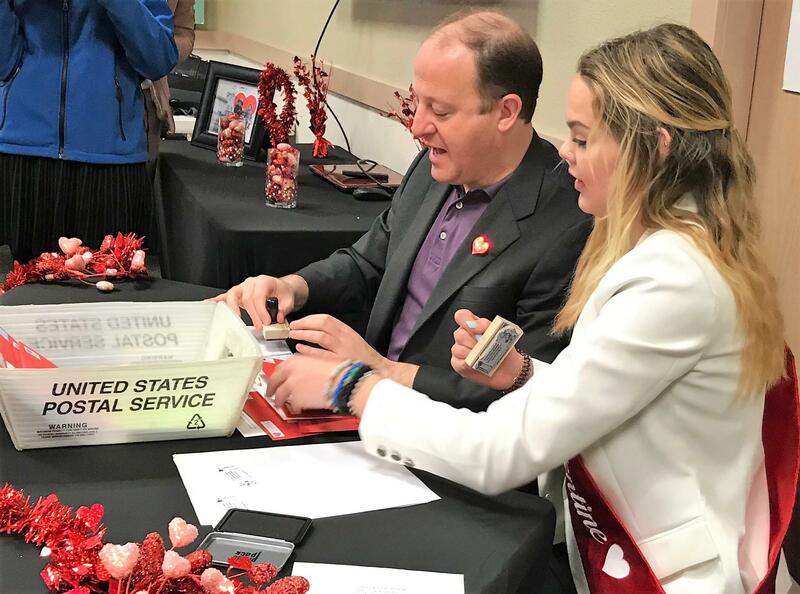 Jared Polis and Miss Loveland Valentine Kat Pfeiffer kick off the Valentine ReMailing Program. Cards began pouring into the Loveland Post Office as early as December to ensure they get a Loveland postmark, Postmaster Cindy Kinney said. Each year, volunteers spend two weeks stamping the cards before sending them on to the intended recipients. While there are other cities that do similar Valentine-themed postal cancellations — including Valentine, Neb. and Hershey, Penn. — Kinney said Loveland’s program is unique. Gov. 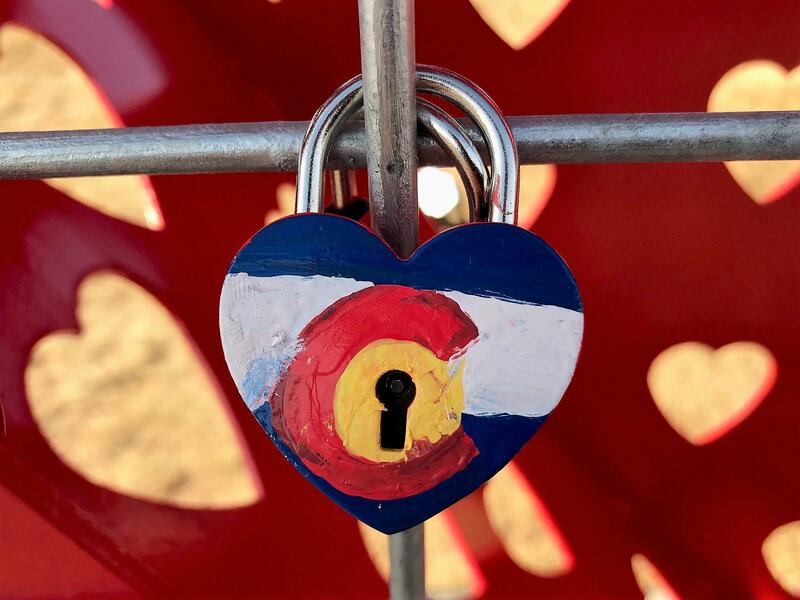 Jared Polis placed a Colorado-themed padlock on the Love Lock sculpture. It’s not just a postmark, Kinney said. Each year, Loveland reaches out to the community to help design a special stamp and a poem, known as a “cachet,” that goes on each card. The popular program is a tradition for many, she added. A new tradition for the city is its new “Love Lock” sculpture. The 24,000-pound, 10-foot-tall, 30-foot-wide steel sculpture spells out “L-O-V-E” and includes cutouts for padlocks to be locked to it. The piece was inspired by a custom believed to have originated in China where lovers lock a padlock on a chain, gate or bridge and then throw away the key to symbolically “lock” their love forever. The Love Locks sculpture was designed by local artist Doug Rutledge. 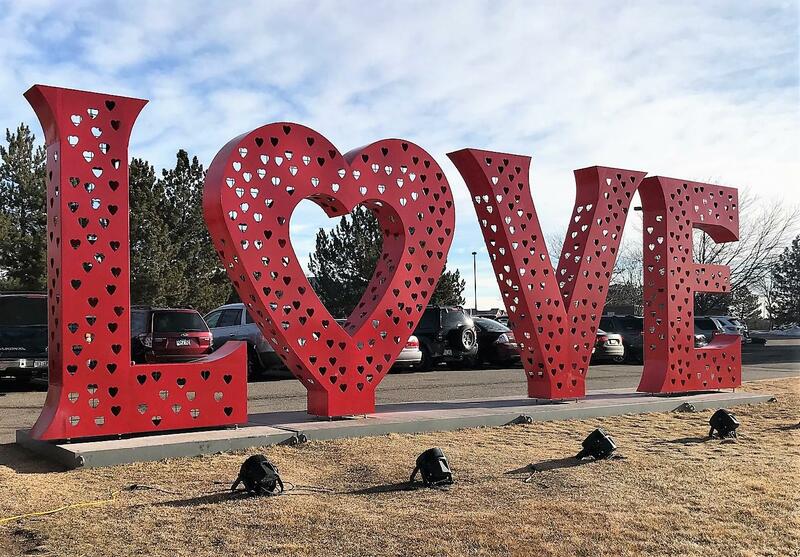 This year’s sculpture was designed by local artist Doug Rutledge and will be on display in Downtown Loveland as part of the city’s new Sweetheart Festival on Feb. 8 and 9 before moving to the Loveland Visitor’s Center. 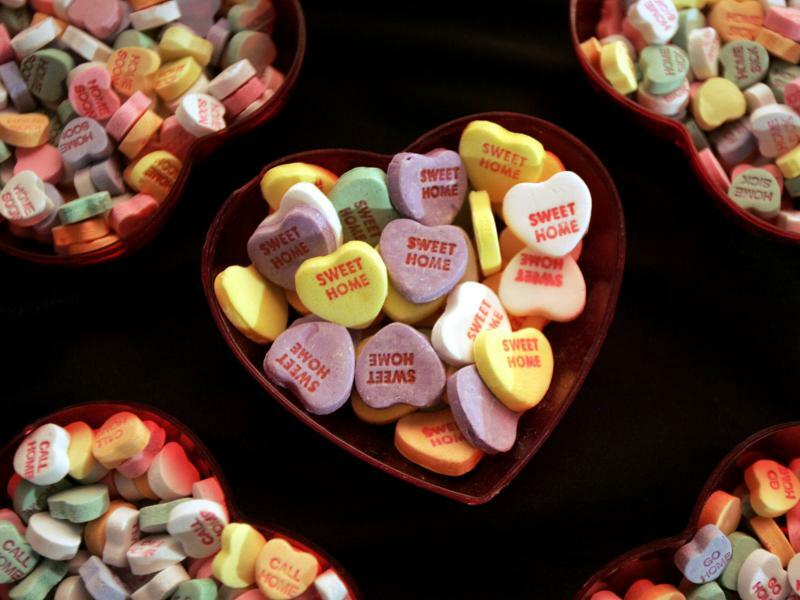 Almost everyone who lives in Northern Colorado has probably heard of Loveland's Valentine remailing program. The U.S. Postal Service says the program, which turns 70 in 2016, is the largest of its kind in the country, handling between 150,000 and 200,000 pieces of mail each year. Beginning as early as December, cards and letters start pouring in from all over the world. For about two weeks before Valentine’s Day, the sound of stamping fills the Loveland Chamber of Commerce. The National Sculptors’ Guild Sculpture Garden is meant to showcase how the outdoors can be an ideal place for art. Executive Director John Kinkade said the garden is purposefully kept fairly natural to encourage wildlife. On that count it is perhaps too successful, at least one busy beaver has made itself at home. Maybe not the friendliest of art critics though, right?